The GLX_NV_delay_before_swap extension has been added (this extension is also exposed on the Windows version: WGL_NV_delay_before_swap). Complete release notes are available on the download page. 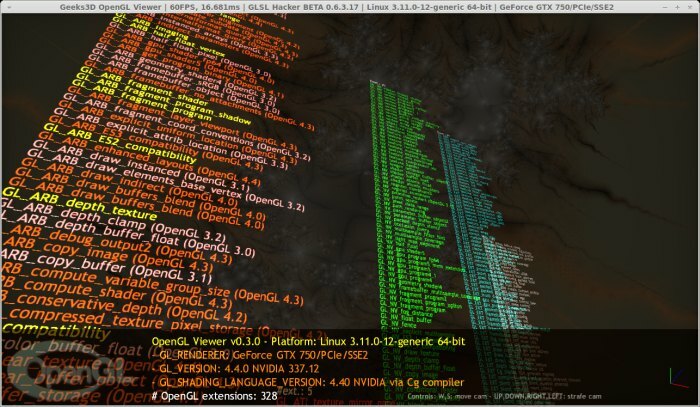 R337.12 is an OpenGL 4.4 driver and exposes 328 extensions (GL_ and GLX_) for a GeForce GTX 750 (Maxwell) under Linux Mint 16. The complete list of all extensions is available in THIS ENTRY of the GPU database (I submitted with GpuTest 0.7.0). Are also exposed. That will benefit Wayland development mainly. And Coolbits are back 🙂 So overclocking work after few years of no support. PS GpuTest need EGL_* support! Now that is present in Catalyst (on Win too), Geeforce and Mesa. Nvidia GeForce 340.24 UNIX drivers. Nvidia 343.13 UNIX beta drivers.